Throw whatever sad costume your mother hand-sewed for you in the trash. The cutting edge of 2017 Halloween fashion has arrived. 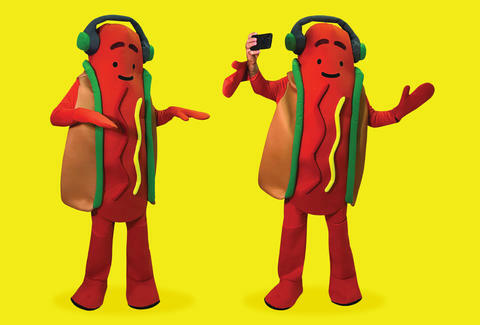 Behold: the official Snapchat Dancing Hot Dog Costume, yours for the low price of $80, or about the price of three decidedly not-dancing hot dog costumes. The gyrating staple of American dining is at the top of Thrillist's list of the best memes of 2017, and the hugely popular filter might be America's greatest invention since the actual hot dog. This is as topical as viral fashion gets. The groovy, grooving frankfurter costume is one-size-fits-all and "100% beef, but never starts it," according to the official product description. Rest assured, the costume's attached, claw-like hands pull back so you can stay snapping as you proceed from compliment to compliment on your impeccable, festive taste. Your feet will be covered, as well, maintaining your appearance as several feet of felty, lobster-red beef. The costume, which is the only item in Snapchat's Amazon store, is available for two-day shipping so you don't have to decide just yet. It is, however, unlikely you'll find anything better than this. Plus it has a four-star rating! Granted, the product was only uploaded on October 17, so it's unlikely that all of these are first-hand testimonials. One choice claim gushes, "We have lanned [sic] on the moon, invented the internet, and curred [sic] so many diseases, out of all the things humanity has done this out shines [sic] them all out. Thank you snap chat [sic] for adding on to [sic] our achievements." Another reviewer claims he wears the costume to church every Sunday, which, again, is unlikely since this was uploaded on Tuesday. Not everyone's so positive about Snapchat's first foray into Halloween fashion. One review read in its entirety as follows: "I don't want to live on this planet anymore." James Chrisman is a News Writer at Thrillist who sometimes feels like a dancing hot dog. Send news tips to news@thrillist.com and follow him on Twitter @james_chrisman2.